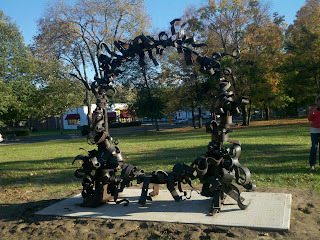 Amherst Biennial: Saving Kendrick Sculpture!! We're Almost There!!!! Saving Kendrick Sculpture!! We're Almost There!!!! I'd like to thank all the art enthusiasts from our community for stepping forward to support Art in the Park. We reached our goal for our second installment to secure Matt Evald Johnson's sculpture the Portal in Kendrick Park Amherst. Donations have come from all sectors of our community including the President of Hampshire College, Amherst Town Manager and his wife, recent graduates of UMass and many community members. We still need to raise just $1,000 more to reach our goal of $10,000. We're almost there, if we reach this goal soon, we will have a ribbon cutting ceremony this Fall. So don't delay, let's make this happen soon.